For the final event in the V&A Future Series, we're joined by a host of award-winning designers including Dr. Alexandra Daisy Ginsberg, Nicholas Masterton and Priya Prakash. Hosted by Mariana Pestana, curator of our exhibition The Future Starts Here, each designer will present their projects that are trying to change the world. 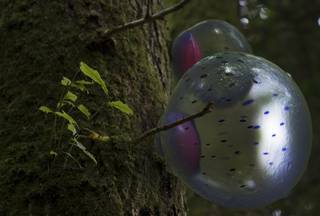 We are joined by Dr. Alexandra Daisy Ginsberg, named "One to Watch" by the Financial Times, who develops objects, fictions, installations and exhibitions to explore the future of nature. She is currently working on resurrecting the smell of extinct flowers alongside wilding Mars, and in the process, asking us to consider our relationships with nature and design. The Cambridge University and Royal College of Art graduate has become instrumental in the field of synthetic biology and has spent over 10 years researching the design of living matter. Hear from Nicholas Masterton about the work of his fascinating Turner Prize - nominated agency, Forensic Architecture, which must be one for the few, if not the only architecture firm on the planet that designs no buildings. Instead, he's part of a team of architectural engineers, lawyers, data analysts, investigators and filmmakers whose mission is to uncover shattering new insights and human rights violations around the world from Aleppo to the UK’s Grenfell Tower disaster. Priya Prakash, is the designer-founder behind award-winning studio, D4SC - Design for Social Change that develops collaborative products and services by combining both human and machine intelligence. Accessible platforms and democratic technology are key drivers within Priya’s work; she was lead-designer and co-inventor of the BBC’s iPlayer platform. She was also listed on the Queen’s 2017 Honours list. Propela is the world’s leading agency for the creatives that are crafting your future. At Propela, we only represent mavericks working on the bleeding edge of the arts, design, science and technology. From Body Architects and Food Artists to Cultural Hackers and Fashion Futurists, all our Speakers are true thought leaders and provocative visionaries with a healthy disregard for the impossible. Propela is where industry go for far future thinking.